A one-size-fits-all approach to public health regulations where much remains unknown about the potential benefits is rarely a good idea. But this is what some legislators and health advocates are promoting by calling for the regulation of e-cigarettes in publicly used indoor spaces. They believe the uncertainties about e-cigarettes are cause enough to place them on the list of items on the state’s Clean Indoor Air Act. This would ban the use of e-cigarettes in places like office buildings and restaurants. But there is enough known about smoking tobacco in general and using e-cigarettes in particular to insist that those calling for this ban should prove the new devices are harmful before legislation is passed. State Sen. J. Kemp Hannon, R-Nassau, who is sponsoring the bill in the Senate, believes that a “lack of oversight is placing individuals at risk because there is little known about the chemical makeup of the liquid nicotine or the harm to individuals from inhaling the vapor directly or through secondhand exposure,” he wrote in a memo related to the bill. No one is denying that tobacco use threatens people’s health. While a direct and conclusive link between tobacco use and lung cancer has never been scientifically proven, the overwhelming medical research conducted shows that cigarette use is the most likely candidate for the many horrific health conditions from which many smokers suffer. E-cigarettes hold some hope for smokers because they don’t burn tobacco, which poses the greatest health risks. They also contain less nicotine, the addictive ingredient that hooks smokers. E-cigarettes allow users to experience some of the sensation they get from smoking cigarettes while scaling back on nicotine and, thus, becoming unhooked. Like nicotine gum, e-cigarettes may benefit smokers by easing them off nicotine to the point where they can quit completely. 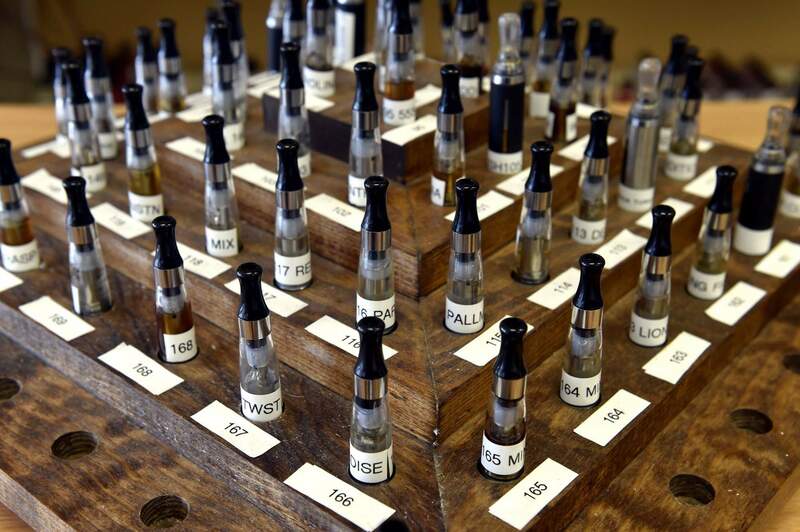 Many doctors find that e-cigarettes offer a less-harmful alternative to smoking cigarettes. But the drive to ban them in indoor spaces seeks to equate their public use with that of cigarettes. A report titled “Safety evaluation and risk assessment of electronic cigarettes as tobacco cigarette substitutes: a systematic review,” prepared last year by the National Institutes of Health’s National Center for Biotechnology Information, suggests that those who would ban them may be jumping the gun. The same misrepresentation took place in 2006 when then-U.S. Surgeon General Richard Carmona declared: “Even brief exposure to secondhand smoke has immediate adverse effects on the cardiovascular system and increases risk for heart disease and lung cancer.” It’s well established that secondhand smoke is a risk to people’s health, as pointed out in a report released that year by the U.S. Surgeon General’s office. But Dr. Carmona’s statement that brief exposure to secondhand smoke poses similar risks was not supported by medical research. Dr. Michael Siegel, a professor in the community health sciences department at the Boston University School of Public Health, wrote in 2009 that secondhand smoke is indeed harmful for people with pre-existing conditions for heart and lung disease. But he refuted Dr. Carmona’s declaration that brief exposure carried risks comparable to smoking. It takes many years of direct exposure to cigarette smoke to develop the type of heart and lung diseases associated with cigarettes, he wrote. It’s true that research needs to continue into any potential adverse effects of e-cigarettes and the substances they use. But lumping them in the same category as cigarettes and using this fear to ban them from indoor spaces is the type of “irrational application of the precautionary principle” that the NCBI’s report warns against. Measured steps are needed to ensure that people who use e-cigarettes and those exposed to the smoke produced face as low a risk as possible. But banning these devices from public spaces without sufficient evidence that they pose the perceived harm would not be productive. Fearmongering should never replace scientific facts.